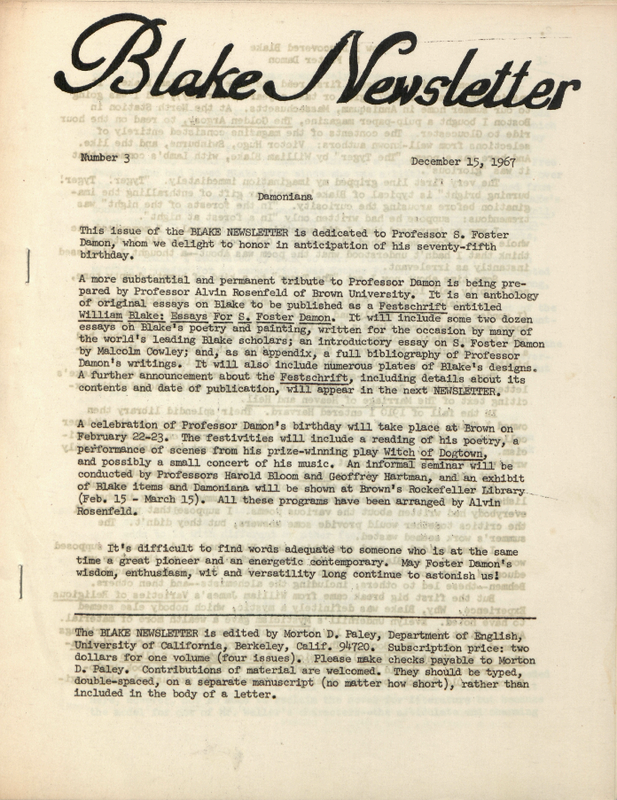 The BLAKE NEWSLETTER is edited by Morton D. Paley, Department of English, University of California, Berkeley, Calif. 94720. Subscription price: two dollars for one volume (four issues). Please make checks payable to Morton D. Paley. Contributions of material are welcomed. They should be typed, double-spaced, on a separate manuscript (no matter how short), rather than included in the body of a letter. Regarding the copyright announcement on p. 18. It was suggested to us that we copyright the NEWSLETTER in order to protect ourselves and our contributors from the possibility of its being reprinted without our permission at some future time. Reprint companies seem to have become active even in rather remote fields of scholarship, and it does seem to me that if the NEWSLETTER ever should be reprinted, it should realize some of the benefits. (It would be nice to have an occasional photographic reproduction, for example. I promise not to abscond to Golgonooza with the profits.) Writers of articles are of course free to use their material elsewhere. The fourth issue of the NEWSLETTER is scheduled for publication on March 15. Copy should be received by March 7 in order to be considered. The contents of the BLAKE NEWSLETTER are copyright 1968 by Morton D. Paley and may not be reproduced without permission, except for brief excerpts quoted in reviews or articles.